This candy was really good. It was very easy and it was a little fudge like. The toasted pecans give it great flavor, so don’t skip that step. I made it with both white and milk chocolate. These are rich and this recipe makes a lot, so you may want to half the recipe. Preheat oven to 350 degrees. Bake pecans in a single layer in a shallow pan until toasted. This takes about 8-10 minutes. Stir after about 5 minutes and keep checking and stirring, so that they do not get over done. Line a 15×10 inch jelly roll pan with waxed paper. Lightly grease the wax paper. Place chocolate and sweetened condensed milk in a bowl and microwave. It took about 3 minutes and I stirred it every 30 seconds. When melted, mix well to combine. Stir in toasted pecans and vanilla. Spread onto wax paper and chill until set, about 2 hours. 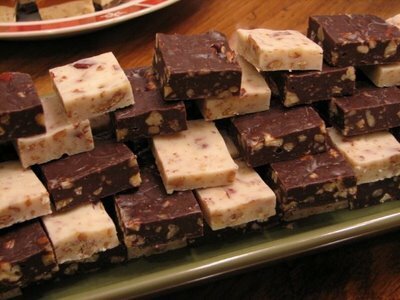 Turn candy onto cutting board and cut into squares. Serve. For more great Holiday desserts see The Happy Housewife. And for a great recipe swap see Grocery Cart Challenge. wow, those look yummy! I am baking all next week and my list of things to try keeps getting longer, lol! Talk about rich! I’ll bet those taste good! I love anything with pecans. Thanks for sharing this! YUMMY-O! Can’t wait to try this one! That looks great and it sounds so easy! I love the taste of toasted pecans, as does my husband. I know my husband would love this too. Thanks!